De Bellis Antiquitatis (DBA) – the Worlds – was a two-day competition held at CanCon 2013. DBA is a short form of an ancient wargame much-loved by those who play it. Some are perhaps overly passionate about their favourite version of the game – it is a game after all – but that does indicate the depth of feeling for the game. Over the last few weeks I have been posting about the progress of my painting efforts and I am pleased to report that the armies arrived at CanCon in tact and ready to game. What follows is a brief after action report for Day 1 of DBA – the Worlds. Day 2 will be written up later. The opening battle was against Mark Baker and his Dacians (Book II/52 ((the armies that can be used are defined in the rules by a book number (I to IV) and then a list number. The list may further be subdivided into sub-periods – his was the earliest variation)) which are an army I’ve not encountered before. This was the first time I had been using my Koreans. I really should have got some practice games in with them to start with but ran out of time. In this battle I was the attacker although the Koreans are generally not very aggressive. The terrain was difficult with two woods and some steep hills, very much like Dacia. I advanced and met the Dacians along the woods-steep hill line. It was getting interesting with 2 elements destroyed from both sides when I managed to kill his general and it was all over. An 8-3 win to start the competition. A good start. This was against Brenton Searle using one of the few book I lists – in this case, I/2a Early Egyptians 3000-1640BC. Brenton noted, “this is not a killer army”. As I noted, “neither are these Koreans”. 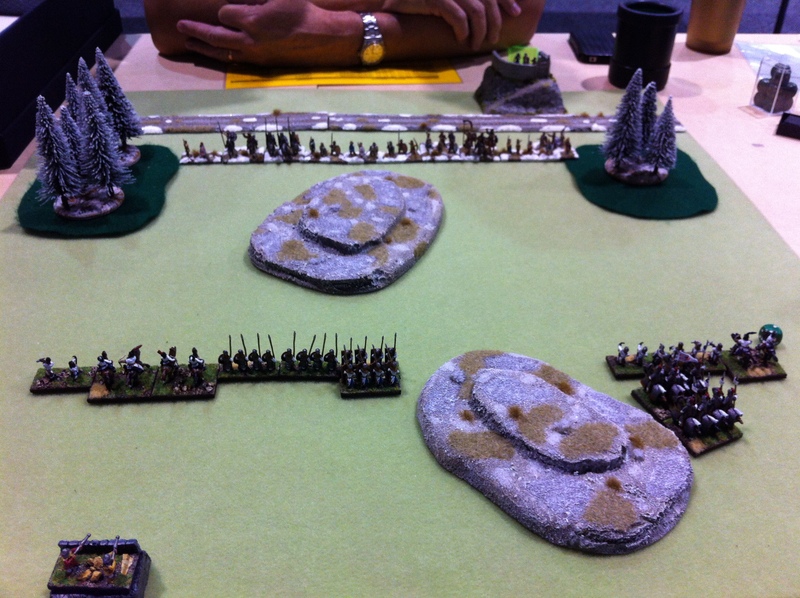 We rolled dice and added aggression factors which resulted in me defending for this battle. I didn’t manage to photograph this game but looking at the composition of the armies, the deployment becomes kind of apparent. I was trying to set my knights onto his blades, he was trying to set his blades onto my bows and spears. After a bit of maneuvering I managed to get my general up against his general, the result of which would have been a quick kill of his general and proceeded to roll down on the dice. My general became hors d’combat and it was game over. Results was a 1-8 loss. Brenton went on to win day 1 of the competition. I went into round three with a win and a loss, still, I managed a second at CanCon 2011 after one loss in six rounds and there I had that loss in the opening round. I was feeling confident then until my opponent, Lachlan Bayliss-Smith, announced that he was using Classical Indians. This army contains three elephants, all of which are very fatal opponents to my knight general. My confidence evaporated a little. Lachlan was the defender, me the attacker for this battle. He ended up deployed around a couple of woods. 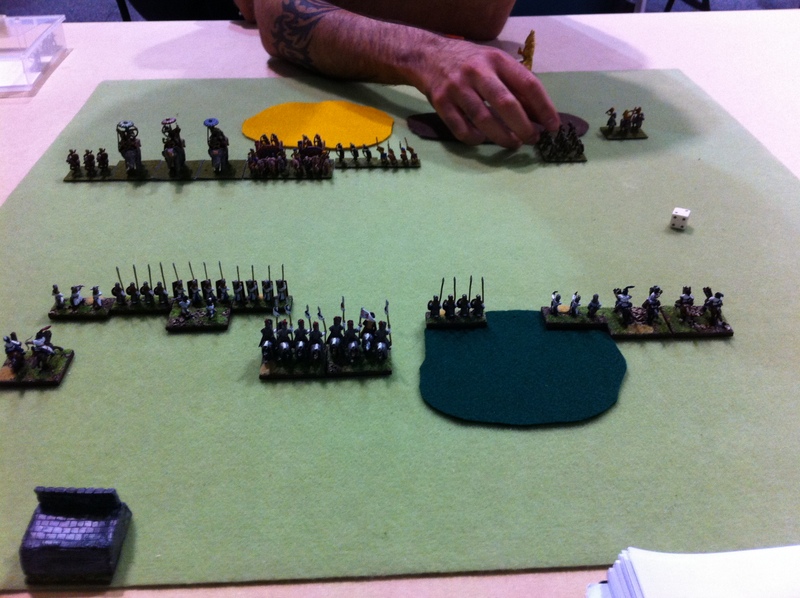 Lachlan’s tactics were to try and overwhelm my light horse with his mounted and to hit my knights with his elephants. Elsewhere his bows and blades were evenly matched with my spears and bows. I will admit in this battle some good dice rolling helped me considerably however the best part was when my knight general with a little assistance from my Psiloi eliminated one of his elephants. At the end, it was an 8-3 ((I should note that the scoring here was 8 points for a win, for a loss, 1 point plus an additional point for each enemy element killed or camp looted. A draw earned zero points for the draw plus one point for each enemy element killed or camp looted)) win to me. This was against the Marian Romans of Joshua Bayliss-Smith (Lachlan’s brother). Another battle I did not get a photo of. I was again the attacker in this battle and Joshua tried to use the opening bound to move an element into a position that threatened my camp. I countered that and we maneuvered a little against each other. My knights had the advantage over his infantry however his infantry had a strong advantage over mine. After stripping the troops from his flanks I eventually managed to attack and defeat his general. I eliminated 5 elements from the 12 in his army, one of which was the general. Final score was 8-2 my way. By this stage I was feeling like there was a chance of doing quite well with the Koreans, four games and only one loss. I then had to face Greg Kelleher’s Mithridatic Pontic army. Greg was the competition organiser and his army was one of the prettiest there. In a change of fortune I rolled low and with my low aggression factor I became the defender for this game. Simple terrain of a road and a couple of woods made this a fairly open battle (the woods are the blue areas in the photo – yes, I know, I’m not sure what happened, they were green when placed)! We maneuvered against each other and I managed to get into what I thought was a favourable position only to have my general die in cruel combat. The result was then a 2-8 loss to me. The last battle of Day 1 and the one that would decide the “ancient” champion was against Brad del-Munns who was using another Classical Indian. I had already beaten an Indian earlier today so was feeling nervous again – the elephants are very difficult for my army to manage. Fortunately I rolled high on the aggression dice and as such I was the attacker. 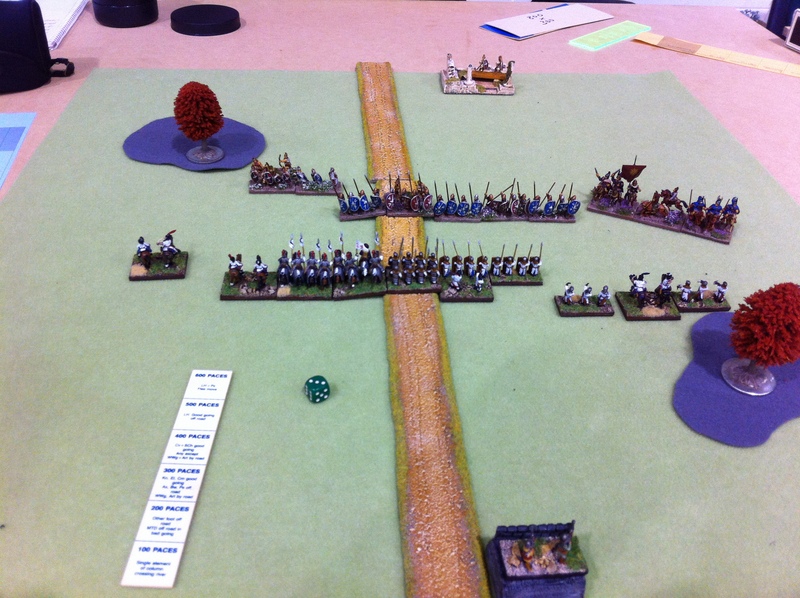 Brad set the terrain, we deployed and his elephants and chariots were deployed mostly against my infantry. After a few rounds of maneuvering the combats started. It was tough for me in this battle. We were both three elements down (one short of victory or defeat). In the last bound of melee I managed to kill two of his elements (including another elephant) for an 8-3 victory. I returned with Doug (thanks Doug and Gillian for the accommodation, food and company) to his place. We then showered, changed and went out for an evening barbecue at John Garvey’s. 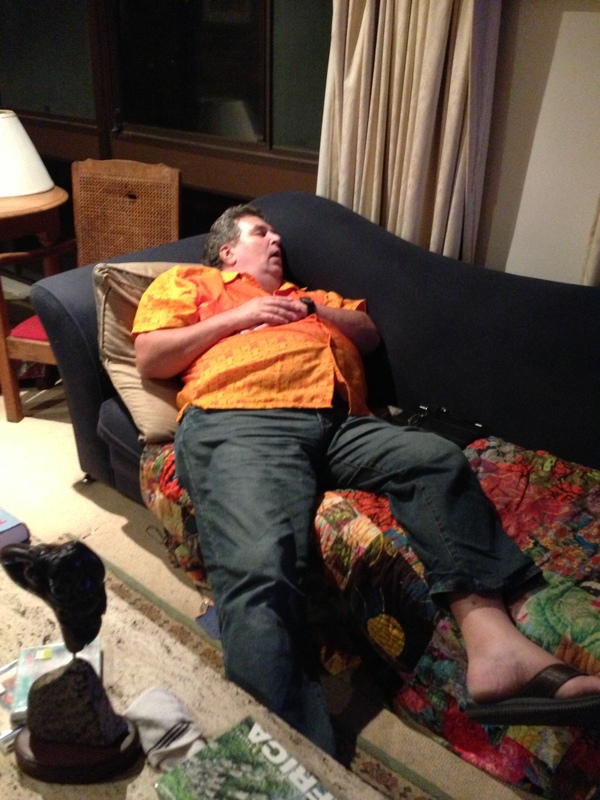 This photo was taken of me watching the Australian Open Tennis after returning from the barbecued lamb at John’s (thanks John and Cathy). Yes, I was sharp, alert and ready for the next days combat!